This course is concerned with characteristics and critical aspects of the stability of excavation slopes; methods of designing slopes, including field observations and experience, slope stability charts, and detailed analyses; factors of safety; and methods of stabilizing slopes and slides. Excavation slope instability may result from failure to control seepage forces in and at the toe of the slope, too steep slopes for the shear strength of the material being excavated, and insufficient shear strength of subgrade soils. Slope instability may occur suddenly, as the slope is being excavated, or after the slope has been standing for some time. Slope stability analyses are useful in sands, silts, and normally consolidated and overconsolidated clays, but care must be taken to select the correct strength parameter. Failure surfaces are shallow in cohesionless materials and have an approximately circular or sliding wedge shape in clays. The emphasis in this publication is on simple, routine procedures. It does not deal with specialized problems, such as the stability of excavated slopes during earthquakes. Learn how to use the Simplified Wedge Method to address slope stability issues. This course is intended for civil engineers, structural engineers, geotechnical engineers, geologists and other design and construction professionals wanting an introduction to methods and techniques for addressing slope stability issues in earth structures and earthwork. This course will give engineers and other design and construction professionals an introduction to tools that can be used to address many slope stability issues. 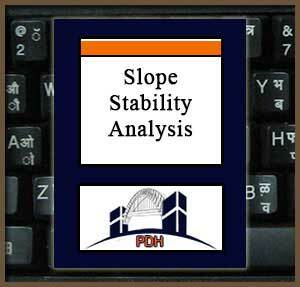 This is an introduction to methods for analyzing slope stability problems. This course will give you an introduction to methods that can be used to address many common slope stability issues.